I think fall is officially my favorite season in terms of seasonal produce. If you’ve read previous posts, you know that I love pumpkin. 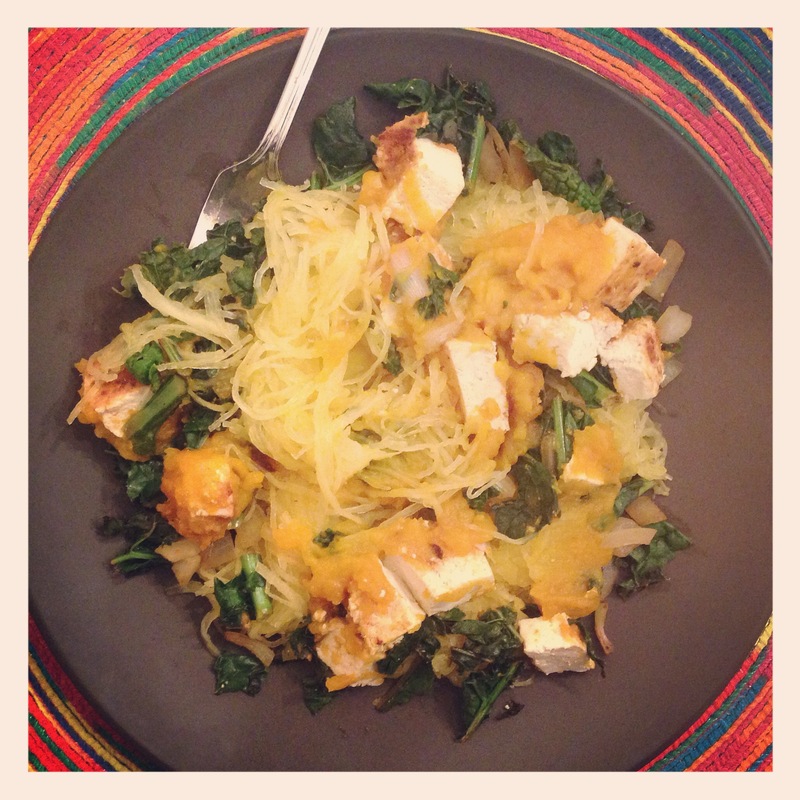 I also love kale, spaghetti squash, and tofu seems to be my go-to source of protein as of late. So what better way to enjoy my favorites than combine them in an incredibly nutritious, seasonal recipe. The following recipe is high in protein, healthy fats, fiber, vitamin A, vitamin C, vitamin K, and doesn’t take too long to cook either. If you don’t have fresh pumpkin, feel free to use canned (just make sure you’re using pure pumpkin puree). Cut the spaghetti squash in half (the long way). Take a sharp fork or piercing device and poke holes to aerate the squash during cooking. Place the squash halves (soft side facing up) in a microwave safe dish and add 1 cup of water, dividing half of the water beneath the squash and the remaining water poured into the exposed soft sides of the squash. Cover with either a piece of paper towel or press and seal wrap. After the squash has finished cooking, remove from the microwave and allow to cool. *Important to keep in mind: the squash is going to be extra hot, especially as you remove the squash “innards” (my weird little name for the spaghetti-like insides). Take this time to taste the tofu-pumpkin/kale combo and feel free to adjust any spices, oils, or accompaniments that you feel would complement the dish. After the squash has cooled a bit, take a fork and remove seeds. The rest of the spaghetti-like strands should be easy to remove. Place on a plate and top with the pumpkin-tofu, kale, and onions.